The Teachings of Shin Buddhism, the Japanese Way of Wisdom and Compassion. Shin is the uniquely Japanese flowering of the type of Buddhism known as "Pure Land." It originated in the thirteenth century with the charismatic and prophetic figure Shinran (1172–1263), whose interpretation of the traditional Pure Land teachings was extremely influential in his own lifetime and remain so today. In a period when Japanese Buddhism was dominated by an elitist monastic establishment, Shinran's Shin teaching became a way of liberation for all people, regardless of age, class, or gender. Although Shin is one of Japan's greatest religious contributions—and is still the most widely practiced form of Buddhism in Japan—it remains little known in the West. 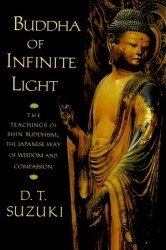 In this book, based on several lectures he gave in the 1950s, D. T. Suzuki illuminates the deep meaning of Shin and its rich archetypal imagery, providing a scholarly and affectionate introduction to this sometimes misunderstood tradition of Buddhist practice.